Ramona Tree Service, Maintenance, Tree Trimming, Tree Removal, Stump Grinding, and More. 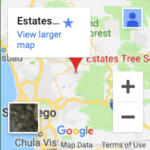 Estates Tree Service has been proudly located in Ramona, California since we started our Ramona Tree Service business in 1992. We look forward to working with the great residents of Ramona and we do everything in our power to keep our rates affordable while providing top notch services to residents of Ramona and throughout all of San Diego County. Estates Tree Service is also very proud to offer 24/7 Emergency Tree Service to Ramona and all of San Diego County, if you ever need us, you can count on Estates to be there! Living in a rural community like Ramona California, fire danger is something that is always in the back of your mind, San Diego County has been devastated by many large fires over the years and Ramona especially has seen its fair share of dangerous wildfire. Preventative maintenance such as Land and Brush clearing, Dead Tree Removal, Tree Trimming, Chipping and Hauling of Tree Waste, all contribute to keeping your property safe and building defendable space around the house that you’ve worked so hard to make your home! Estates Tree Service is always available to provide a free estimate to our neighbors in Ramona, and we have worked with agencies like Cal-Fire and the Forestry department to rid public land of dead trees, brush and other fuel for wildfires. Besides wildfire, Trees that are not maintained present many dangerous conditions, during our annual Santa Ana season trees have been known to come down and topple roofs, cars and anything else in their path leaving a trail of devastation in their path, our services such as Tree Removal contribute to keeping your property safe and sound during these weather events. Tree Trimming is especially difficult and should only be handled by professionals, Estates Tree Service has been providing Ramona Tree Trimming Services since our inception, our crew of trained, insured and professional staff are equipped with the knowledge and the tools to get the job done right without a trip to the Emergency Room, in the United States thousands of homeowners each year sustain injuries, or in some cases fatal accidents from attempting to trim their own trees. Sometimes there are jobs that the average Ramona homeowner just is not equipped for and in most cases Stump Grinding is one of those tasks, stumps left in your yard present tripping hazards, they’re unsightly, and if the tree stump has not been fully killed the tree will most likely just grow back! Estates Tree Service Stump Grinding in Ramona is affordable and will prevent any accidents from tripping! We also guarantee that the tree will not be growing back! 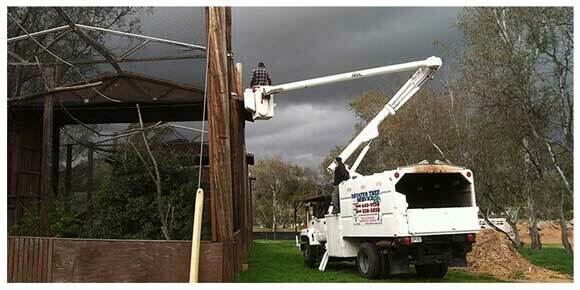 The Importance of hiring a licensed and insured company for Ramona Tree Service. Unfortunately, there are many tree service companies providing services throughout San Diego County and Ramona that are not licensed and Insured, it is your right as a consumer to request their information! In the event that you do hire someone that is not licensed or insured you’re putting your property at risk of damage that will not be covered and will likely be dragged out in the legal system while your house is in shambles. Estates Tree Service is proud to be Licensed, Insured, and Trusted by Ramona Residents and residents of San Diego County. Specializing In The Following Ramona Tree Services.